Too Faced has launched so many new collections lately! (Pstt.. check out their It Comes Naturally & Festival Collections). Next up: their Clover Collection which dropped today, 3.22! The collection includes a new Melted Clover Liquefied Lipstick ($21), a LIMITED EDITION Clover Makeup Bag ($20), and (of course, a collection would not be completed without…) an eyeshadow palette ($49)! 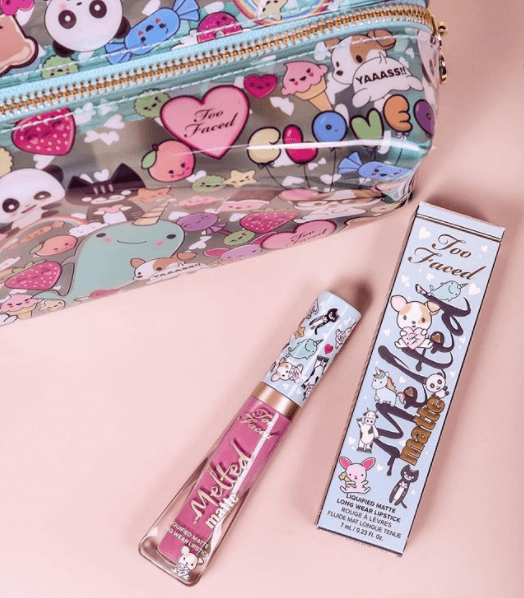 Besides being so absolutely adorable, Too Faced is donating $250,000 to animal charities to celebrate! WOW! We absolutely adore every part of this. So yeah, the eyeshadow palette isn’t new, but it’s kind of what inspired the whole collection so we just had to mention it! There have been tons of mixed reviews on this bad boy – some people love the interesting color scheme while others weren’t so keen on the pops of green and yellow or how childish the packaging seems. Personally, this has kind of grown on us! I would consider purchasing it if it ever went on sale (I don’t love it enough to pay full price). As for the makeup bag – we can do without it. Especially when you can get a totally awesome makeup bag pretty much anywhere else for half the price. Almost the same goes for the new lipstick. The only thing it really has going for it is the suuuuuuper adorable, limited edition packaging. I mean, it is reallyyyy adorable! Kind of more of a collectors item than anything else, we’re thinking. But still cute nonetheless!